Height Adjustable from 18 inches to 20 inches, slip-proof seat top is 16 inches. We've all had times when we'd like to be able to sit down in the shower - say when we are washing our feet, and sometimes we can all get that 'giddy' moment as we bend down and feel a bit woozy in the process. This Swivel Shower Stool enables you to enjoy a shower or bath - for as long as you need in complete safety. Long luxurious showers can be enjoyed, and shower and bath-time can become a pleasure again as you are able to enjoy your shower in safety. The shower stool swivels a full 360° so you don’t have to twist and strain your lower back or hips, or twist around which could unbalance or destabilise you leading to a fall. Did you know your shower could be a killer? Falls are a common cause of death in older people, and as we live longer, we need to be able to protect ourselves and minimise hazards in the home. We were surprised to learn that over 1/3rd bathroom falls required a hospital admission, simply because as we get older we have greater difficulties with mobility, vision and balance which makes us more likely to slip and fall. Researchers filmed people aged 60 years and older who, while fully clothed demonstrated how they use a shower or bath. Out of the 89 participants, over 1/3rd showed difficulties such as 'plonking' into the bath, or hitting the side of the shower cubicle, or shower tray they entered. Sliding glass doors in showers were a big hazard as users grabbed onto them for balance. One participant had a plastic lawn chair as a bath seat, a particularly hazardous improvisation given the curved shape of a bath. With our swivel stool you'll find that the non-slip feet give extra security and lock in place for stability for use both in a shower cubicle or a bath with shower over.. But wait - it's not just older people who are in danger in a shower or bath. A recent US study by the Centre for Injury Research claimed that more than 43,000 children 18 years and younger in the United States are treated in accident and emergency departments annually for injuries occurring in a bath or shower. After a swimming pool a bath is the second major site for drowning in the home. Shower in absolute safety - always. Preventing falls and minimising risks is essential! Made from strong sturdy plastic this disabled shower chair can support up to 400 lbs and is the perfect way to prevent a fall in the shower. As more of us choose to live at home in our older age, products like this swivel shower stool become invaluable in helping us to keep independent, but more importantly safe. Its a simple product, but something that no shower should be without. 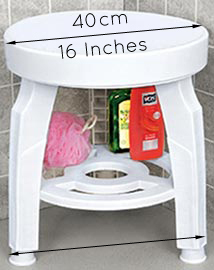 Convenient storage shelf underneath the seat to store shampoos, shower gels and loofahs within easy reach - so you won't topple over, or lose your balance reaching for your shower accessories.